Although this article is going to tell you about the iPad and its business use applications, I must confess something up front: I lead a a double life. By night I am a gadget-head; someone that likes having, evaluating, and playing with the coolest and newest technology that might just change our lives. During the day, I run a consulting company which provides IT leadership services. While my night time persona is certainly more fun at parties, I love my day job and am quite passionate about it. I provide IT leadership for my clients, and they look to me to inform them how new technology can impact their business. This situation invariably requires my team and I to occasionally acquire the latest in gadgetry and test it in a real world environment, which fortunately feeds my alternate persona's desire for cool new gadgets/toys. So when I started hearing rumors of tablet computers, and ultimately that Apple would be the first out of the gate, I started preparing myself for the eventuality of making this purchase on the day of its launch. For this to be a justifiable expense and not just another piece of nifty hardware, I wanted to do something that would help my clients understand how this tool could help them (or not). I needed to conduct a real-world experiment, something that reflected a business use case that would illuminate whether the iPad was just a fad or if this was a truly useful new tool. It is important to note that there have been three relatively recent phenomenon that have changed how an organization uses information, communication, and technology. I mention them because without these recent advances, tablet computing would not be as potent as it likely will be in the next few years. Also referred to as Software as a Service (SaaS), cloud computing allows the user to perform the same tasks via a web page that would have traditionally only been possible by using software that is installed locally on a computer. What this does from a systems standpoint is allow you to have your data move easily between a mobile device and a laptop/desktop computer and to do so via the Internet (WiFi or 3G/4G). Mobile apps have opened up a new frontier for software and are generally tailored to the specific device(s) for which they are built. They generally connect with existing cloud-based solutions and can be very intuitive to use. Whether you are using social media for your business, personal use, both, or not at all, the number of individuals using social networking tools (i.e. Twitter and Facebook) has exploded in the past few years and has opened up new opportunities and threats to explore. Staying informed of how this new communication frontier can and will affect your business is good practice. The duties of my job require me to be mobile. In addition, I am also a self-proclaimed "power user", in that I am on a computing device for most of the day and do the majority of my work (70%) on computing devices. While I am primarily based in and around the metro Milwaukee area, I will travel for work outside of the state. This is important, as WiFi alone does not satisfy my connectivity needs. The tools I use are a laptop and a Blackberry, and I use them extensively. If the iPad was going to work for me, I needed to be able to replace one of those two devices, not simply carry around a third piece of equipment. First, let's give an example of the devices I used Pre-experiment. Phone calls, reading work e-mail, basic web browsing, calendar checking and SMS text messaging. I use this phone constantly, as it is my sole form of voice and SMS communication. The battery life is good with the screen brightness lowered (lasts me a whole day), the coverage is good, and the Gmail (Google Apps) App is a great addition. The phone seems well constructed, having survived multiple drops; it also has several other apps that I have found useful (Twitter, Foursquare, Notes). There is a decent availability of apps for business services, and it has little bells and whistles like a camera and a keyboard. As long as I have 3G coverage, my phone is always connected to the Internet. The web browsing is slow, but I blame that on the Curve processor and the insufficient capability of the Blackberry web browser, not the carrier. I use multiple calendars, which Blackberry does not support. It will also not sync to multiple address book services (i.e. Exchange and Yahoo). The keyboard is small although I can type fairly quickly on it, and the screen is small as well. Managing e-mail, calendars, contacts, web browsing, administering the company web site, project management, client management, task management, document creation/editing (Word, Excel, Google Docs, Adobe Creative Suite), and file management (local files before they are uploaded to the cloud). With my laptop, I can do anything for my work or personal life that requires a computer. I can use multiple browsers (Firefox, Safari, Chrome, Internet Explorer), different applications (even Windows applications), and have local file storage for managing documents. I can create any kind of document I need, edit it, and send it via a variety of different methods. Needless to say, I have been a laptop user for more than 5 years, and had never planned to be without one. The weight, size, and battery life are some of the issues I face with a laptop. While larger screens are good, even the new slim machines can seem large compared to the ultra-small and portable laptop or Netbooks in the marketplace. The weight is not terrible, but could be lessened. The battery life is a bigger issue, and it becomes even more difficult to manage when you have more and more applications running in the background. But the biggest issue with my laptop by far is that all of my services are cloud-based, and I need to have connectivity to the Internet to access them. Because these are mission-critical tools, I need to be connected to the Internet throughout the day. While Milwaukee has a decent amount of free WiFi hotspots at local businesses, WiFi is not available everywhere. I could buy a data card through my cellular provider, although I would be spending close to $60-80 per month for 3G service, and then I would have to carry an additional device: the data card. I decided to try this for at least 30 days without interruption. I was already familiar with the OS that powers the iPad through my experience with the iPod Touch, and had researched, downloaded, and paid for most of the apps I would need to use the iPad. It did take a little time to find the apps I needed, and sometimes the app you want does not exist. If that happens to you, simply wait until someone develops the app, or find a local iPhone developer and DIY (do it yourself). After purchasing the iPad, the setup through iTunes made transitioning to the iPad a snap. All of my apps migrated successfully from the iPod Touch to the iPad, although I had to re-create some of the settings for mail, calendar, and contact accounts, as well as some of the account settings for my apps. All in all, it only took a few hours to get this done. Because voice communication on the iPad was limited (even though it has a microphone), I decided to try replacing my laptop instead of my phone with the iPad. I could use the run-local software like Adobe Creative Suite and Microsoft Office on my home desktop, and because the iPad was built for consuming information (and because I had been doing this via WiFi on the iPod Touch) I knew I could manage my mail, calendar, and contacts successfully. Purchasing the 3G model required me to wait close to 30 days after the initial WiFi iPad launch, but 3G service would allow me to keep in touch with my team and my clients everywhere I went (that had AT&T data coverage). So I went ahead and made the commitment to leave the laptop at home and use the 3G iPad full-time. This would give me a complete experience of the iPad, its full capability to be completely mobile, the capability of the 3G network of AT&T, and the limits of the technology. I should also mention that being "in the cloud" with your data and services can really make this transition much easier. I had transitioned my company to use web-based tools for file sharing, project management, task management, client management, and social media the prior year, and many of those services had apps. I purposely chose services that had iPhone, Blackberry, or Android apps developed or in the works when I selected these services, which also made this transition easier. This little bit of planning made the transition to not using a laptop much easier than if I was attempting to use the iPad without having any of that in place. My first impression of the iPad was that it was sleek, easy to use, and heavier than I expected. But after 30 days of use, I love this device. I enjoy not being tethered to WiFi hotspots and being able to communicate regularly from anywhere. While I still take some notes on paper, I do project mapping, shorthand notes, and diagramming on the iPad. I have completely replaced using my laptop altogether and use the iPad almost exclusively for my computing needs. I barely use my laptop even when at home. However, this product has some drawbacks that keep it from being what it may eventually become: a computing device that is going to change the way society consumes and produces information. The very first things I noticed were weight, temperature, and screen. The interface was pretty similar to the iPhone/iPod Touch, just larger. The weight was heavier than I expected, although I have become accustomed to it. As for temperature, the device never gets hot. Ever. Although I did find out during an outdoors strategy meeting in the middle of a summer day that Apple was smart enough to put a thermometer in the iPad; it will overheat and shut down if used too long in the sun. The last of the initial items is the screen. A lot of complaints have come forth about the high gloss screen, and rightfully so. The screen is perpetually marred by fingerprint smudges; it is nearly impossible to see when working in direct sunlight. I did find a solution just a few days ago that might answer all of these problems and provide a scratch-proof covering for the screen as well. One of the biggest deciding factors determining whether or not I could actually use the iPad was the keyboard. I hate small keyboards and am a tactile typer; I want to feel the keys to know where my fingers are supposed to go. Imagine my surprise when I picked up an iPad and found myself able to easily type on it with one hand. Before I purchased the device, I played with the keyboard for about 5 minutes and was completely sold. Whether you are typing on the full iPad keyboard or the smaller iPhone keyboard (which can be exploded to a larger view), typing on the iPad is easy. Dare I say, I can type as fast on the iPad as I can type on a regular keyboard, and while the spelling correction feature can be annoying at times it can also be very helpful. If any of you used to watch the Star Trek TV series with Patrick Stewart, you might be reminded of those fancy data pads that the actors would use to record lots of data with minimal effort. After 30 days of using this device, I can now record information on the iPad in a similar fashion, with rapidity and accuracy. One of the best accessory purchases I have ever made, and probably the best accessory for the iPad, is the Apple iPad case. I bought it to protect the iPad, and while it is sleek, simple, and protective, it also doubles as a horizontal or vertical stand. The stand feature makes it much more ergonomic when typing long e-mails or taking meeting notes and makes typing even easier than if it was flat on the table. So the iPad works well for me. The reason? Apps. Ever since getting an iPod Touch, I have become something of an app junkie. While Apple is not the only mobile device manufacturer in the marketplace with an app store, iPad/iPhone/iPod users have access to some really simple and effective apps; many of which are useful tools that make the difference between the iPad being a home user's gadget and a viable business device. I have been able to find apps for all of the major cloud-based services that I use to manage my life, my clients, and my workload. However, some of these apps are better than others. Some of them are sort of expensive, while some of them are frustratingly limited in features/functionality. When you find an app that ties into a service you use, has good features and takes advantage of the capabilities of the mobile device it runs on, it will change the way you view mobile devices. My business uses cloud-based tools, all of those services have iPhone/iPad apps, and since I did the research before making the purchase, it was really easy to transition to this new device. BUT... and this is a big one: you can not create documents on the iPad without apps. The only one I have found to date is Apple's iWork. I currently use OpenOffice, Microsoft Office, and for document collaboration/sharing I use Google Apps and Box.net. While the latter two have apps that allow reading and consuming documents, they will not create documents. Nor can I use my web-based document tools on the iPad to create Google Docs or Box.net web docs. The technical reason for this is Apple's mobile Safari browser lacks certain functionality that is required to edit web-based documents. Until this is resolved, I believe the iPad will be stifled from taking its place in the business world as a fully functional replacement for a laptop. My hope is that the forthcoming iPad operating system update (fall/winter 2010) will resolve this issue. The two best usability features of the iPad are battery life and the touch screen. When initial reports indicated that iPad battery life was close to 10 hours, they weren't kidding. Running apps in the background and working on it all day, I can be away from a power supply and on the 3G data network for 8-10 hours. This has been a welcome change, as my laptop has many applications running and typically only gets 2-3 hours of use before it gives up. The iPad interface is where the future of computing is headed. Eliminating the extra hardware (keyboard, mouse), and allowing a user to navigate or type with their hands makes these Apple devices very easy to learn and use. In comparison, using other mobile device's touch screens (i.e. Android, Windows Mobile) seems awkward by comparison. While all apps do not take advantage of the iPad's new form factor, and some of the apps do not fully utilize the touch-screen interface, the apps that are successful in melding with the iPad interface create a fun and easy user experience. Multitasking is a major part of what many of us do during the day. However with technology, some of us have the tendency to overdo the multitasking to the point where it becomes distraction. On that matter I actually enjoy the simplicity of the iPad's "one app at a time" operation. This also helps to keep processor utilization down, which extends battery life. With all of the various information sources I interact with, it is nice to be forced to focus on only one or two things at a time. Although I do look forward to being able to multitask two apps at once when the new iPad OS update happens, since it is helpful to be able to go back to a referring document when writing an e-mail. While HTML5 is an interesting technology, it does not compare to the widespread distribution and support of Adobe's Flash product. Apple's staunch reluctance to adopt this technology has created a bit of a row with Adobe and is a detractor to using the iPad. While I can still watch YouTube videos through the YouTube app, I cannot see certain web pages or certain content on web pages. This has detracted from some of the web browsing experience, although I have been able to get by just fine without Flash. This is a typical Apple move, to release a product in phases. Most likely the 3rd generation iPad will have a camera, or possibly even a camera/video capture device onboard. While I would have liked to see this feature on the 1st generation iPad, it does not detract from the experience; not until Android or Windows Mobile tablets start coming standard with cameras. This is by far the BIGGEST complaint I have of the iPad, which is why I have now mentioned it twice. The only way to currently resolve this issue is to use ONLY Apple products (iWork, MobileMe) to create documents or back them up with online storage. I did all of the right things to prepare myself for using mobile technology like moving my files to the cloud and managing everything with web-based services, so this was a bit of an oversight on Apple's part to not build this in. I was hoping to be able to write on the iPad and then paste it into a formatted document and can not do it using the services or products I currently utilize (Google Docs, Box.net, Microsoft Office). While the iPad is a revolutionary device, this was a terrific oversight that will hopefully be answered by an opportunistic app developer. An advantage of the iPad in these areas is the growth of the iPhone. Apple has had four generations of iPhone experience to incorporate the needs of the enterprise into the iOS. The iPad has some built-in security with a lock password, and has handy password features like wiping the data on the device if you incorrectly enter the password 10 times. Managing the iPhone in an enterprise environment can be done with configuration profiles in one of several methods. The ability to deploy, configure and secure phones is an essential feature for businesses with more than 25 mobile phones, or for companies that have mission critical or confidential data on their mobile devices. 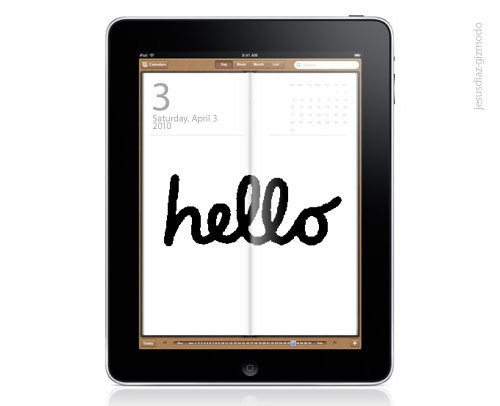 The iPad and other forthcoming tablet devices will change the landscape of IT in the corporate world. Where cloud computing was the first step, and is still gaining a lot of buy-in from IT professionals around the world, the improvement of mobile devices that take full advantage of cloud computing will help to make that a reality. Unfortunately, that reality is still is on the horizon. The document creation feature is critical, and the further development of new apps that take full advantage of the iPad interface will continue to improve the capabilities of this new technology. While the iPad has great potential as an enterprise business tool, it should still be treated like a mobile phone in the enterprise environment. For most users it can replace a computer, and as businesses start to employ apps for their information management needs, these mobile devices will become more and more useful.